One interesting collection of military records you can search for your genealogy is the Civil War Soldiers and Sailors System (CWSS). The CWSS site is a joint project of the National Park Service, the Genealogical Society of Utah, and the Federation of Genealogical Societies. The site contains an index of more than 6.3 million soldier records of both Union and Confederate soldiers. Also available at the site are regimental histories and descriptions of 384 battles. 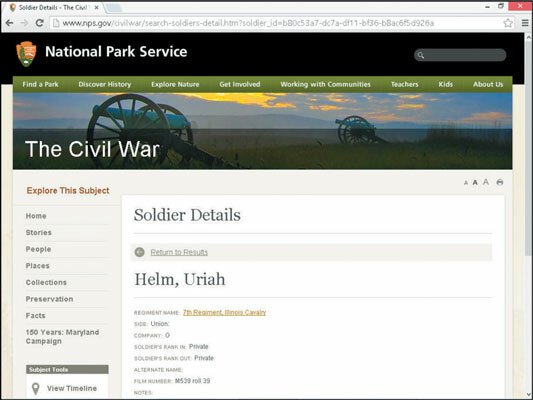 Point your browser to the Civil War Soldier and Sailors System. On the left side of the screen are links to information on the site, including links to Soldiers, Sailors, Regiments, Cemeteries, Battles, Prisoners, Medals of Honor, and Monuments. Click the appropriate link for the person you’re looking for. You’re looking for a soldier who served, so you click the Soldier link. Type the name of the soldier or sailor in the appropriate field and click Show Results. If you know additional details, you can select the side on which your ancestor fought, the state they were from, and rank. In this example, you type Helm in the Last Name field, Uriah in the First Name field, select the Union radio button, and type Illinois in the By State field. One search result appeared with that information. Review your results and click the name of the soldier or sailor to see the Detailed Soldier Record. The soldier details show that Uriah served in Company G, 7th Illinois Cavalry. He entered and left the service as a private. His information is located on National Archives series M539 microfilm, roll 39.